Pioneer Electronics (USA) Inc., Professional Sound and Visual Division, is making the top DJ mixer in its line even better with the announcement of the new DJM-2000nexus performance mixer. The perfect complement to the recently released CDJ-2000nexus multi player, the DJM-2000nexus offers more music mixing functions, including the new Beat Slice and Sync Master, available in conjunction with Pioneer’s Pro DJ Link. In addition to the newest features, the mixer incorporates a built-in full-color 5.8-inch LCD multi-touch panel with screen effects, evolved Beat Effects, Pro DJ Link and MIDI control capability. “The first generation DJM-2000 has become today’s premium professional mixer, found in the best and hottest venues around the world, and now we’re making the next edition of the mixer better than ever to enable DJs to perform at the highest level,” said David Arevalo, senior marketing manager, Professional Sound and Visual Division for Pioneer Electronics (USA) Inc.
With Pro DJ Link, the DJM-2000nexus can be easily linked together (via LAN cables) with multiple Pro DJ Link enabled Pioneer CDJ players for the convenience of sharing a single music-filled SD card1 or USB storage. 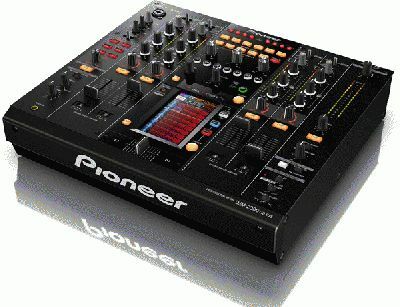 In addition, up to two laptop computers pre-installed with Pioneer’s rekordbox™ music management software can be interfaced with the DJM-2000nexus for times when two DJs want to transition between performances. · BEAT SLICE – When Beat Slice is activated, the BPM of music from a player is automatically synced, a short sample of the track (slice) is temporarily stored in the DJM-2000nexus, and its waveform appears on the built-in touch panel display. The waveform is separated and shown in eight parts (single, quarter, half, and eighth beats) on the display. A touch of each part creates entirely new sound effects that play along with the beat of the sampled music. · SYNC MASTER – The beats (tempo and beat position) of tracks playing on multiple players connected to the mixer via Pro DJ Link are automatically synchronized with the master clock of the DJM-2000nexus. The playback tempo and beats can also be adjusted using the built-in touch panel display, and numerous tracks can be arranged with ease without having to synchronize the beats of each player. The DJM-2000nexus delivers excellent sound quality, utilizing an audio circuit clock that features a highly stable crystal oscillator, as well as noise reduction circuitry in its audio power source. The mixer also features a balanced hybrid op-amp and balanced output circuit in the analog processing stage to decrease induced noise significantly, resulting in a dynamic range of 107dB with 0.004% THD. A newly integrated peak limiter keeps audio playing at all times, even at maximum output level, limiting distortion during playback and preventing damage to the mixer. To increase durability and ensure smooth operation, the DJM-2000nexus features high-performance channel faders that can withstand heavy use. · Layout – The mixer now utilizes chrome-plated knobs for adjusting effect frequencies as well as white LED illumination for the beat button to match the look of the CDJ-2000nexus perfectly. The top center section of the mixer features EFX capabilities to provide a bounty of digital effects, while each side section of the panel offers audio mixing controls for up to four digital or USB sources. The middle section contains INST FX (Instant Instrument FX) functions for additional sound effects. o Frequency mix – Enables more precise mixing within seven frequency ranges. For example, users can enhance just the bass region within the music they’re mixing. o Sidechain remix – DJs can create seven different dynamic audio effects by touching the screen. o MIDI mode – Allows the user to assign various controls displayed on the LCD screen to external DJ software via MIDI. Four types of MIDI modes are available for more performance flexibility. · Evolved Beat Effects – Numerous buttons for the evolved Beat Effects were added for selecting multiple effects and beat parameters. Manipulation of the sound effects can be made using the Effect Frequency knobs that change the low, mid and high frequency bands of the music. With the turn of a knob, users can enhance the effects of each frequency band, i.e., an echo added specifically to the vocals of the music or a doubling of the hi-hat rhythm, providing incredible performance options. · Instant Instrument FX – The INST FX provides six additional audio effects that include Noise, HPF, LPF, Jet, Zip and Crush. Each effect can be brought into the channel with a turn of the Filter knob. Additionally, the Parameter knob allows the effects to be fine tuned. · Live Sampler – A cool feature of the mixer is Live Sampler, which allows the sound from a microphone or from the MASTER output to be recorded directly into the mixer. The “sampled” sound can instantly be transferred via LAN cable to a CDJ-2000nexus or CDJ-900 for scratching or sampling. · Link Monitor – When linked with a CDJ-2000nexus player, the mixer informs the DJ of its connected status. The JOG rings of the turntable change color based on the current on-air status and channel number connection, providing quick visual indications to the DJ. · USB interface – The DJM-2000nexus features a USB audio interface2 that allows a direct computer connection without the need for an external sound card. Up to four audio sources can be assigned to each channel, providing even more flexibility. For additional convenience, the MASTER output can be connected directly to a computer for recording3 of performances. · Auto Standby Function – Switches power to standby mode when no operation or input is detected for a certain period of time. The DJM-2000nexus will be available in November with a suggested retail price of $2999.